In this mixed media art course, we will look to the camellia for our inspiration. I will share my philosophy about when the smallest glimmer of an idea tugs at your brain take notice, write it down, nurture it, devote yourself to it and allow it to become your North Star. This is a beautiful process that will open you to inspiration and ultimately become the creative bridge that will give form and meaning to your art. My spark was a simple flower - the camellia and I would like to share my process and techniques with you. We will begin by taking a trip back in history to explore the official court artist of Versailles, Pierre-Joseph Redouté and his incredible botanical Illustrations. Then, we take notice of a small French novel that inspired Giuseppe Verdi’s famous opera, La Traviata and the painfully beautiful ballet, Lady of the Camellias. Our exploration will also include an iconic French fashion designer who chose the camellia as her signature flower and expressed her creative ideas through fashion. Such beautiful ideas to collect and fuel your imagination! This course is for all levels, whether you’re just beginning your creative journey or in need of inspiration and new projects to explore. Once you have gathered your inspiration, preparation and practice are important steps in the creative process. I will share with you how I prepare and practice in my art journal before beginning a final piece. This part of the process can be very powerful and may result in a more fulfilling and expressive art process. It will not only open the door to inspiration, but will assist in moving you through the fear of beginning something new. This is a gift you give yourself. We will begin by preparing the pages of our journals and develop a beautiful color palette to use through out the class . 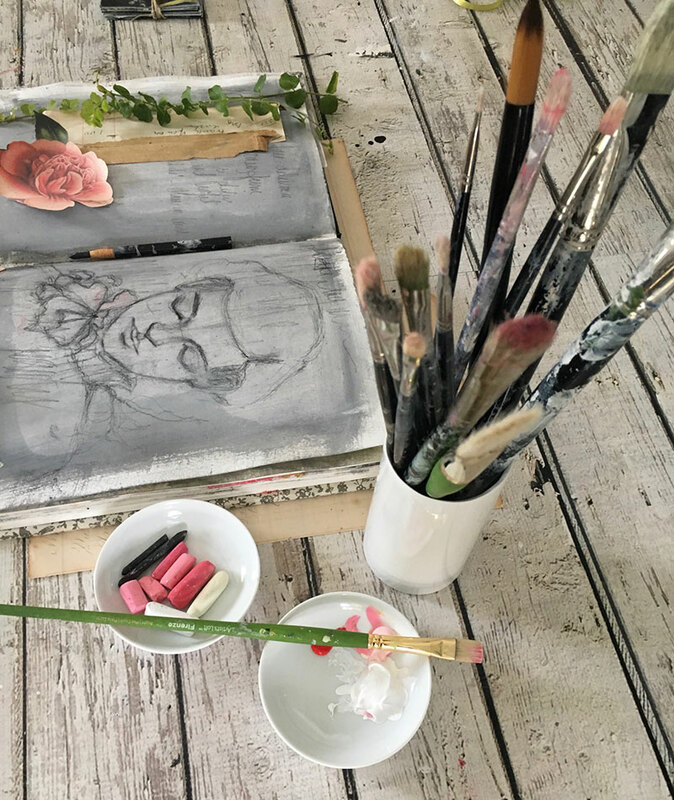 We will warm up by loosely drawing abstract flowers on a toned background with a charcoal pencil and then add a few touches of color with pastel or paint. 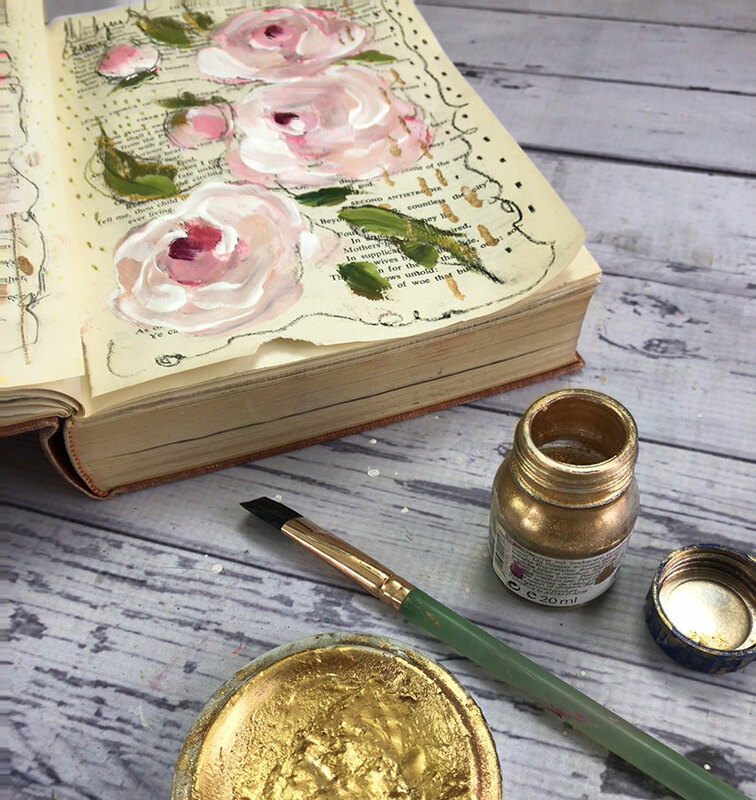 Next we will create a small abstract floral collage out of hand painted vintage paper, add touches of fine gold paint and then finish it off with delicate embroidered details. Your art journal is a place to curate your ideas, practice and play. 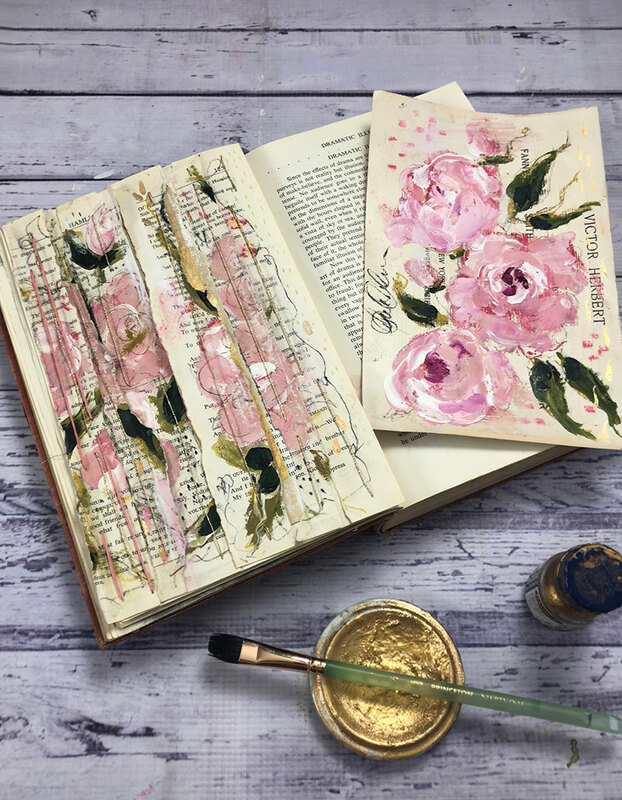 It will allow you to push yourself creatively, combine ideas that inspire you, and experiment with different art supplies. This is a place to honor your creative point of view with layers of beautiful materials, mark making, words and more. Charcoal portrait on gray toned paper. In this next lesson, we will draw a realistic portrait using a photo reference on gray toned paper with a variety of charcoals pencils, powdered charcoal, white charcoal and white pastels. I will share with you how I layout the portrait by first creating a block in of the drawing. Then, we will keep the portrait “open” as we continue to map out the placement of the features, establish scale and proportion, look for the shadow and light, negative space, identify the planes of the face and create smooth transitions and finally adding expressive details to make your portrait unique to you. If you are new to drawing the portrait, I will provide a guide to where the features are placed. Combining techniques and ideas from our earlier projects we will create a more expressive portrait by layering black and white charcoal and finishing with pastels. 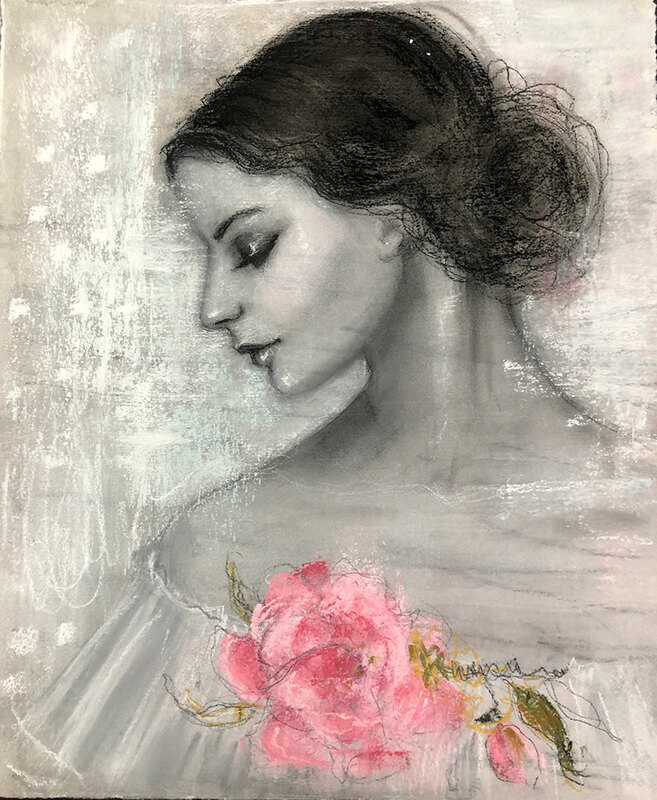 By taking a classical approach to drawing the portrait and then adding your own expressive marks with pastels and charcoal, you will create a portrait that reflects your own personal style. This beautiful portrait will exhibit all the wonderful techniques and learnings we've gathered along the way. Taking inspiration from The Lady of the Camellias and La Traviata, we will create an abstract figure among flowers on a beautifully textured background. We will explore all the materials and techniques we used in the previous projects. Build up layers of pastels, charcoal, mark making and finish off with a touch of gold. Learn how to combine pastels and acrylic paints to create a beautiful texture. Draw a realistic portrait in charcoal. Learn how to identify the relationships and understand the proportions of the face. Use powdered charcoal to create dynamic expressive marks to your portrait. Build layers of pastels and charcoal to create rich textured drawings. I received a BFA from the University of Michigan where I studied Art History, Dance, and Choreography. I danced professionally and had the honor of teaching dance at the University of Michigan's Musical Theater and Theater Departments. Most of my life has been spent in the dance studio and the theater. Because of this, I have had the privilege to work with many talented dancers, costume designers, set designers, lighting designers and musicians. One of the many things that I learned from this experience in the performing arts was to honor your ideas and devote yourself to a subject. Also, to share, support, and collaborate. Once I decided to "exit stage left" I found it challenging to find another creative outlet. Like many of us, I loved to draw, paint and create as a child, but never really invested a tremendous amount of time in cultivating that practice. About six or seven years ago I began drawing again and decided to commit to a daily practice. I was challenged and inspired. So, I continue to practice, experiment with materials and allow my ideas to guide me through the process. When creating art, I draw upon the many methods I learned as a dancer, choreographer, and teacher. Research, gathering inspiration, honoring my point of view and sharing ideas. It is my hope that by sharing my creative practices, my process, techniques and what inspires me, you will find something that works for you.